MailDetective for Exchange Server is an effective tool for corporate mail flow monitoring. 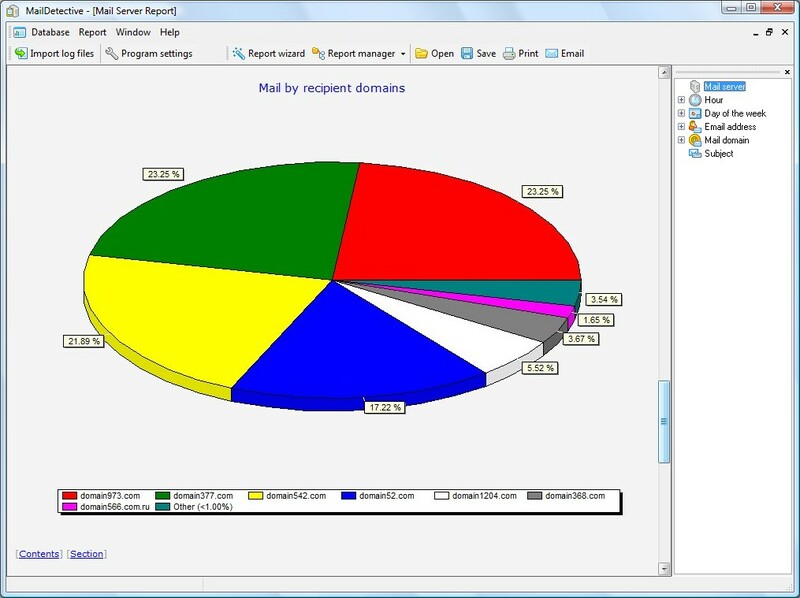 MailDetective for Exchange Server analyzes Microsoft Exchange Server logs and creates comprehensive reports on sent and received mail, traffic distribution, and amount of mail for particular e-mail addresses. Reports are delivered in the form of easy to read charts and can include information on the whole corporation or on individual mail accounts. MailDetective solves the ever urgent problem of corporate mail flow control. MailDetective for Exchange Server, as an e-mail monitoring tool, has already gained great popularity among the companies using Microsoft Exchange Server. It was acknowledged in January 2006 when MailDetective became a second runner up in the Reporting category of the MSExchange.org Readers? Choice Awards. Today MailDetective for Exchange Server brings even more opportunities. Now you can work with several servers using one MailDetective installation. MailDetective for Exchange Server also offers support for Microsoft SQL Server. One more useful new feature is letter subject reporting, including substring search. InboxRULES can automatically print and save message, extract data from message. Recovery for Exchange is a data recovery program for Microsoft Exchange Server. Qweas is providing links to MailDetective for Exchange Server 2.2f as a courtesy, and makes no representations regarding MailDetective for Exchange Server or any other applications or any information related thereto. Any questions, complaints or claims regarding this application MailDetective for Exchange Server 2.2f must be directed to the appropriate software vendor. You may click the publisher link of MailDetective for Exchange Server on the top of this page to get more details about the vendor.